Kochi will be the new headquarters of Air India Express, while Thiruvananthapuram will be the main engineering centre of the airline. Arvind Jadhav, chairman and managing director of Air India, signed papers regarding this recently. This was one of the major issues put forth by the Kerala government. Air India Express is frequented by a majority of expatriates from Kerala and there have been numerous complaints regarding the services of the airline being cancelled time and again. With Kochi becoming the headquarters of the Air India Express, passengers and airline operators are heaving a sigh of relief. However sources in the airline, while speaking to rediff.com, said that it is not clear when the order will come into effect. 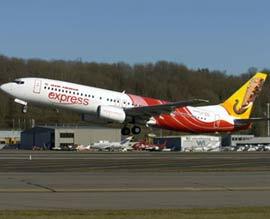 It may be recalled that 70 per cent of Air India Express's flights are operated from Kochi. There have been complaints that if an aircraft develops a snag, a new aircraft has to flown in from Mumbai causing delays, cancellations and problems to passengers. With Kochi becoming the hug, these issues would now be ironed out, it is hoped. Also, with Thiruvananthapuram becoming the engineering headquarters of the airline, around 500 jobs could be created there for the local people.